The state of Uttarakhand is also known as Dev Bhoomi meaning the Land of the Gods as there are numerous pilgrimage sites in this region none more important than the Char Dham and Hemkund Sahib. The Pandavas are associated with the place and the epic Mahabharata is also said to have been written here. The Char Dham Yatra is traditionally always done clockwise, from west to east, starting from Yamunotri then proceeding to Gangotri before moving on towards Kedarnath and finally concluding at Badrinath. The pilgrimage can commence either from the religious town of Haridwar (from where we started ours) or from the capital of Uttarakhand, the queen of the hills, Dehradun. Situated at an elevation of over 10000 feet and perched on the Bander Poonch Peak, Yamunotri is the place of origin of the second most sacred river of India – The Yamuna. The Temple can be reached after a tiring trek of 14 kms from Hanumanchatti or 5 kms from Jankichatti. The main Temple here is dedicated to Goddess Yamuna. A dip here is believed to defend a person of untimely death as Yamuna is the sister of Yama, the God of death. 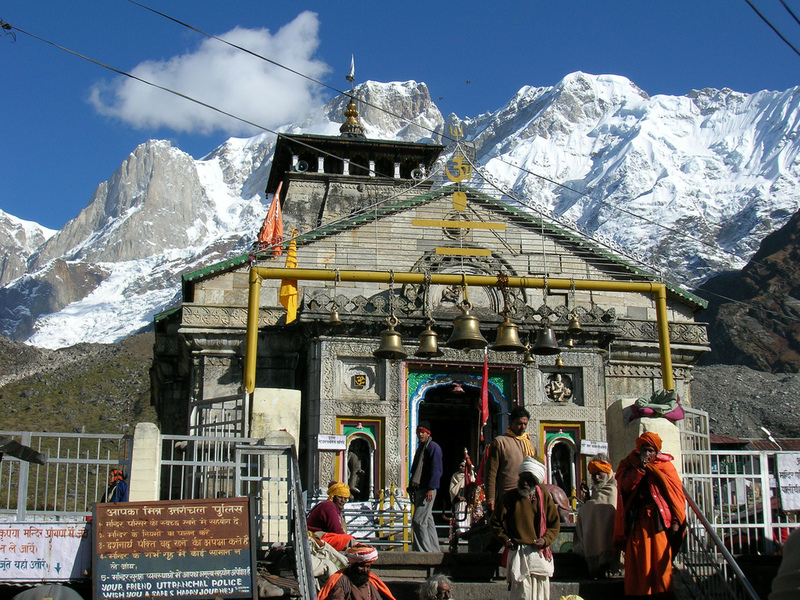 One of the 12 Jyotirlingas, the Kedarnath shrine is situated at a height of 3584 metres or 11800 feet above sea level amidst the majestic Kedarnath range. I had visited Kedarnath in 1996 and I can tell you that the weather there is most fickle of all the four Dhams. It was snowing there in the middle of the summer season!! Situated at the source of the River Mandakini and dedicated to Lord Shiva, it is one of the most important temples in India. The temple is believed to have been built by the Pandava brothers to atone for their sins after the battle of Mahabharata. Devotees are required to trek the last 15 kms to reach the shrine from Gaurikund onwards. Behind the Kedarnath shrine lies the samadhi (final resting place) of Adi Guru Shankaracharya, the 8th century reformer and philosopher from Kerela who established the Char Dhams. As I have travelled to Gangotri and Badrinath, I will describe them in the due course of time as we move along. All the four temples close down in the winter season (October/November) due to the heavy snowfall and extremely dangerous terrain and open in the summers (May/June). Thus all the temples remain closed for about six months and entire towns from the upper regions shift to lower places during this time. Even the deities are relocated to their assigned winter homes during that time. - When the temples open in May/June, there is a heavy pilgrim rush and if you want to evade the crowd, the best time to visit would be Mid September/November when the rush is less which keeps declining as the temple closing dates appear closer. - There are hoardes of agents and companies today offering packaged tours for travelers that promise a quality experience of its own (for example check this: Sikkim Homeymoon Packages). Though it's not necessary and we never took one but if you feel the need, you could consider taking the help of these as well! I find it amazing that whole towns plus the deities are moved during the winter months when pilgrimage is dangerous. Living at altitude, I see how this would be necessary. An interesting post about Char Dham Yatra. I enjoyed the journey to the sacred places with you in your blog. I like temples and Buddhist statues. I am amazed with that many Buddhist deities were converted from Hindu deities and how closely India and Japan related in ancient times through Silk Road!. All photos and words are very interesting and attractive. I love your great blog. Marvelous, informative post as always, Arti! I would love to visit there! The mountains are incredible as are the temples! Terrific captures! Hope you have a wonderful weekend! you are going on the chardham yatra? great!! i have been to kedar and badri ages back... i think in '90 ! things would have really changed now :( incidentally, at one time, chardham referred to the 4 most important temples in the 4 directions - kedar, rameswaram, puri and dwaraka! times change and so do names! Sounds fascinating this pilgrimage Arti! Such a beautiful adventure to embark on, a reat for the whole of your being! Nice to see you are finally at my native state Uttarakhand. I miss the air the climate and over all the divine presence. One suggestion , I have posted one blog over light-box so that all the images can be displayed over the same page via a box then visitor opening it in another tab to have an insight of the place. its very simple and straightforward that you can implement it over your blogs image or contents. The pictures are wonderful. The first one is right on the side of the mountain. And the second with the beautiful mountain over it, I can even see the birds! Many bells on that post, do they each make a different sound? I have already returned, was there in November, during Diwali! The bells make the same sound, there are so many probably because there is a huge crowd during the season. So they have provided many bells so that everyone can get a chance to clang them! This is a very informative post - quite fascinating, and great photos as always. Thanks for this. Thank you, Arti, for this informative post. Spirituality and mysticism is something we share between India and Japan despite prevailing materialism. Pilgrimage to those temples at such a high altitude is really worth spiritual journey in the heart of nature. The second photo, the temple and snow mountain closing to it, is awesome. Look forward to your next post. Always a pleasure to travel with you, thanks for another enjoyable post. That looks like a promising yatra for armchair yatriks like me! Thanks for sharing. Beautiful pics!! I love to read your posts and learn more about India!! A lot of information about Char Dham,it is really fascinating to have the glimpse of the place. Really fun to read your posts with lovely pics! I've always been interested in Indian philosophy so I'm very glad that you've found me and that I can come here. Looking forward to reading further posts! What lovely shrines.. such peaceful places. Hi Arti. Such an interesting post as always. I wish I had a reason to visit the travel tips link, but I don't think a trip to India is in my future sadly! But that is all the more reason to enjoy your lovely blog since I can experience it vicariously and learn so much along the way! Thanks. A divine post..very informative! great going..
Wow, what an insight to a totally different culture than mine. I appreciate your kind comments on my blog today. They made me very happy. The trek must surely be a testament to one's beliefs. This is really exciting trip. as usual,very inspiring narrative. really felt the place. great pics. @Geeta - When Arti publish the post and generally in 2 or 3 Hrs after that I reach the post, this place is flooded with comments. Great info! Equally good pictures!! Fantastic. You might think to upload the pictures on Flicker as well. That will increase the chance that people can find your nice Photos. Great Artice. Very Well Written.